sabin was up helping her father put a coat of outdoor paint on the boards of the roof. on top of that will be a layer of plastic and then some metal roofing that we're reusing. husband calls this style of a rough board on a board "kalmar brædder" and i have absolutely no idea what that's called in english, but i love the rustic look it gives. there are even a few bits of bark here and there - perfect for a treehouse. the chicken house and my garden house will be built the same way (with all that wood we bought a month or so ago). husband very determinedly (and with safety-minded protective glasses and hearing protection) cutting the metal roofing with his angle grinder. since the trees are alive, he has to do some fussy fitting around that tree trunk. the view of the back - there will be a window in the middle and on the upper right (as we look at it), since the tree is rather in the way of finishing that bit with the wooden siding. we're hoping to find some old windows to reuse in it - possibly at our local recycling center. 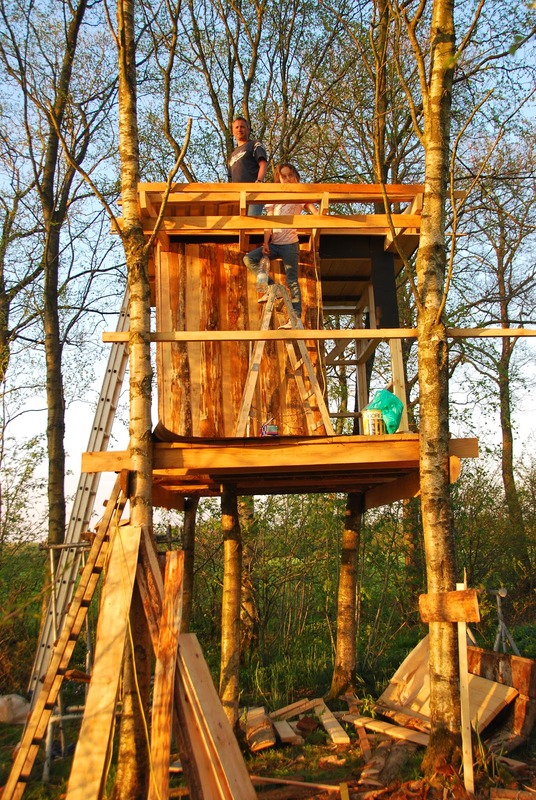 Oh to be a kid again and live in a treehouse! 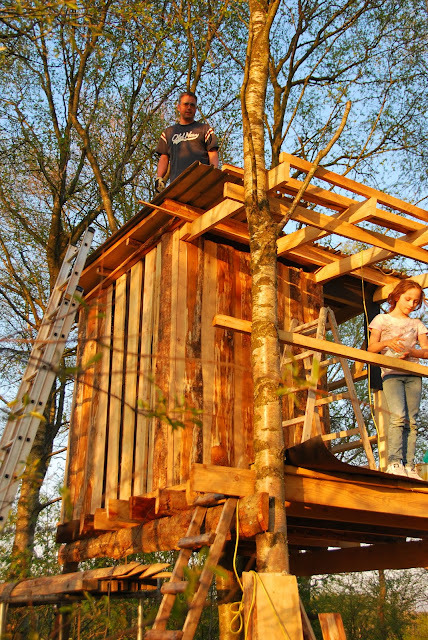 But then, in reality, we do become kids again when we enter the treehouse world. 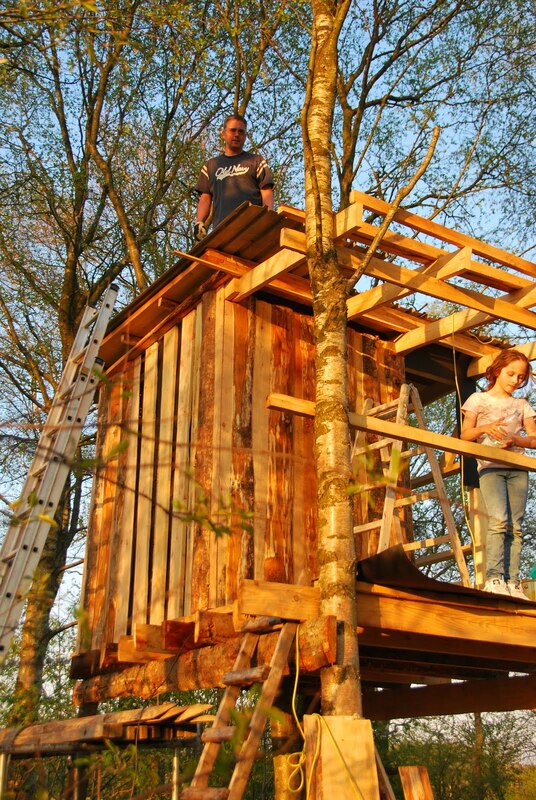 I am smiling, treehouses make some lifelong memories. 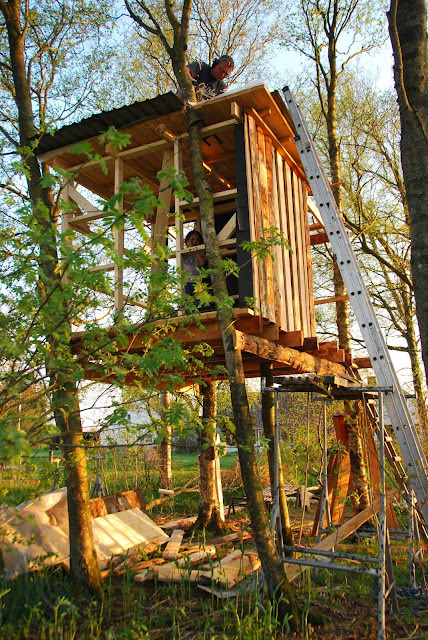 I've always dreamed of building a tree house for my kids. We ended up buying a house and yard with no trees! What was I thinking? How exciting! Happy for your family. We had a wonderful community treehouse in a park when I was a kid -- all the neighborhood kids loved it. Your daughter is a very lucky girl, and I do think your husband is Superman -- much as I love mine, he could never do that! PS: Thanks for your many comments! wow....that had to be one tough nail huh? I love the treehouse. It does take us back to our childhood doesn't it! "kalmar brædder" ... could it be what we call splitpole? rough wood with a bit of bark left on it?